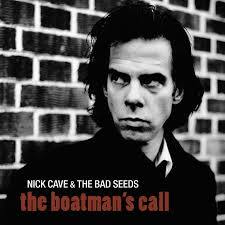 Released in 1997, and following the success of "Murder Ballads", "The Boatman's Call" was a departure from it's predecessor. Ironically, it was far more in keeping with what those who bought the aforementioned "Murder Ballads" on the strength of the "Where The Wild Roses Grow" single would have expected. The raw, violent music found within "Murder Ballads" would have come as a shock to those not either paying attention to the title, or being familiar with Cave's previous work. By contrast, "The Boatman's Call" is sparse, featuring mostly just keyboards and light drums. The mood, whilst not murderous is still dark and moody. Themes of love, loss and faith dominate, explicitly so. There is no implied meaning, Cave lays it all out in black and white. The song titles alone tell the story. "Into My Arms", "People Ain't No Good", "Brompton Oratory", "There Is A Kingdom", "(Are You) The One That I've Been Waiting For?" and "Far From Me". Despite the downbeat atmosphere the songs are just so strong. "People Ain't No Good" is a plaintive, miserabilist waltz. The music says slow dance, the words say reach for the bottle; "To our love send a dozen white lilies, to our love send a coffin of wood". "Brompton Oratory," starting with a cheap electronic drum beat and church organ, gives heartbreak a voice with crushingly perfect lyrics; "And I wish that I was made of stone, so that I would not have to see, a beauty impossible to define". The album's peak, for me, is "(Are You) The One I've Been Waiting For?". A minor chord opening cycles through an uplifting sequence that despite the relatively positive message of the words, still holds a thread of sadness. I can listen to this song over and over again. The upbeat, in the context of the album, trajectory doesn't continue as the next song points us back down again with "Where Do We Go Now But Nowhere?". The mood and style remains consistent to the end, with the exception of "West Country Girl", (an ode to PJ Harvey), which in style if not lyrics could have come from "Murder Ballads". In summary, I consider this album to one of Nick Cave's finest, and one of the best from a year that wasn't short of good music; "OK Computer", "Blur", "Time Out Of Mind", "Sound Of Lies", and "Songs From Northern Britain" anyone? I return to this album frequently to enjoy the warm, comforting bath of melancholia to be found within.